Winner of the Los Angeles Times Book Award, and with writing credits on the hit HBO show Deadwood, as well as FX's Sons of Anarchy, author and screenwriter Kem Nunn shares Chance. A departure from his surfer noir classics, Nunn's new novel is a dark book involving psychiatric mystery, sexual obsession, fractured identities, and terrifyingly realistic violence--a tale told amid the back streets of California's Bay Area, far from the cleansing breezes of the ocean. This event will feature Kem in-conversation with award-winning novelist of the North Beach mystery series, Edgar Allen Poe Award-winner, Domenic Stansberry. Domenic Stansberry's book USA Noir was available from LibraryThing Early Reviewers. 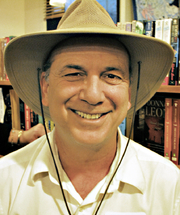 Domenic Stansberry is currently considered a "single author." If one or more works are by a distinct, homonymous authors, go ahead and split the author. Domenic Stansberry is composed of 2 names. You can examine and separate out names.